The BDVA organized its first summit in Madrid from June 17 to 19, 2015 – an event that surpassed expectations with more than 350 attendees from all around Europe. Altogether 17 speeches and 60 working sessions showed important trends and opportunities for the European Big Data Community. 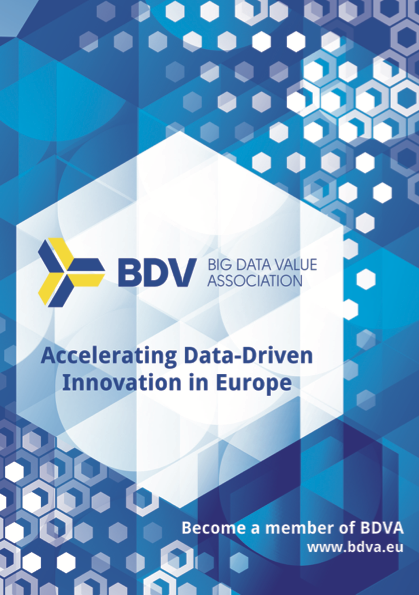 In cooperation with BDVA, the BigDataEurope project has set up a survey identifying current and future challenges for Big data and data management across the seven H2020 societal challenge sectors. The primary objective of the survey from the project's point-of-view is to elicit requirements for the big data integrator platform which the project seeks to design and develop. The results will also be used as input for the BDVA's efforts. Please take the survey here. The European Data Forum (EDF) is an annual meeting place for industry, research, policy makers, and community initiatives to discuss the challenges and opportunities of data in Europe, especially in the light of recent developments such as Open Data, Linked Data and Big Data. The European Data Forum (EDF) 2015 will take place on November 16-17, 2015 in Luxembourg. The Big Data Value Association AISBL is a fully self-financed non–for-profit organisation under Belgian law. Currently there are 24 founding members from large and SME industry and research. The BDVA shall present an industry-led contractual counterpart to the European Commission for the implementation of the Big Data Value PPP cPPP. A basic principle is openness, transparency and inclusiveness. Big Data Value Association is pleased to announce the election of Jürgen Muller, Head of Strategic Research, SAP SE, as President of BDVA. Jan Sundelin, CEO, TIE Kinetix, and Jose Maria Cavanillas, Director of Research & innovation, ATOS were elected as his Vice-Presidents. Stuart Campbell, CTO at TIE Kinetix, was appointed as Secretary-General of the BDVA. He will be responsible for the day-to-day administrative management of the Association, supported by his Deputy Secretaries, Nuria de Lama, Research and Innovation Representative to the EC, Atos, and Julie Marguerite, European Research Cooperation Manager, Thales. Tonny Velin, Managing Director, Answare, was appointed as Treasurer. At the General Assembly gathered in Barcelona on 18th November 2014, it was agreed that the Board of Directors will have 36 members of which 24 will be Founding members and 12 new members. According to the bylaws first terms of the Board of Directors is two years. The signature of the Big Data Value Public Private Partnership (BDV PPP) took place on 13 October 2014 at the Hotel Silken Berlaymont in Brussels, by the European Commission Vice-President Neelie Kroes and the then President of the Big Data Value Association Jan Sundelin, TIE Kinetix. The BDV PPP signature was the first step towards building a thriving data community in the EU. Already in November 2013 in Vilnius Vice President Neelie Kroes called for the creation of a European Public Partner Partnership for Big Data. Vice President Kroes highlighted that Big Data is becoming the fuel for innovation, powering and energizing European economy. On the 2nd of July 2014, the European Commission published a communication entitled “Towards a thriving data-driven economy”. This communication outlines that the Big Data Market, which is expected to grow worldwide to USD 16.9 billion in 2015 at an annual rate of 40%, is a great opportunity to create new jobs and growth. However, it also points out that Europe has been slow in embracing this revolution, compared to other competitors like the USA. The communication addresses this challenge by sketching the features of the European data-driven economy of the future and setting out some operational conclusions to support and speed up the transition towards it. On the 2nd of July 2014, the European Commission published a press release which urges national governments to embrace the potential of Big Data. The main problems identified by the Commission in the field of Big Data are the lack of cross-border coordination, insufficient infrastructure and funding opportunities, a shortage of data experts and related skills, as well as a fragmented and overly complex legal environment.